Spring honors contract approvals are due by the 15th day of classes, January 30. If you are planning to contract a course this spring, please speak with your professor and then email your honors advisor to start your contract in WorkFlow. For more information on the contracting process visit the Course Contract page on our website. 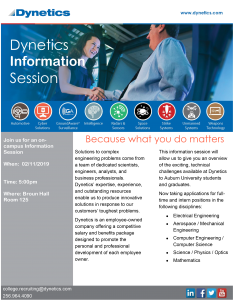 Please let your advisor know if you have any questions. Dr. Sippial is looking for a team of students who would be interested in producing an exhibit on the history of the Honors College in honor of our 40th Anniversary celebration. While public history coursework or experience is preferred, it is not a requirement. Peer Tutoring Sessions will begin Tuesday, January 22. Available in Physics, Biology, Chemistry, Organic Chemistry, Calculus I, II, and III. For detailed times and locations visit the peer tutoring website. 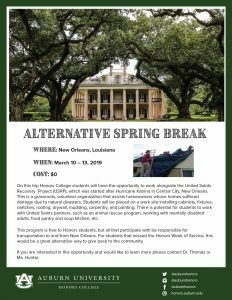 From March 10 to March 13, 2019, Honors College Students will have the opportunity to work alongside the United Saints Recovery Project in New Orleans, Louisiana, which was started after Hurricane Katrina hit Central City, New Orleans. This is a grassroots, volunteer organization that assists homeowners whose homes suffered damage due to natural disasters. Students will be placed on a work site doing things from installing cabinets to painting. 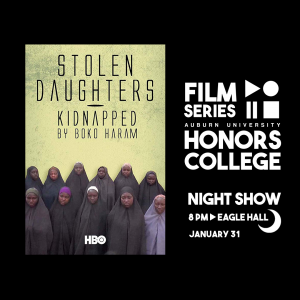 There is no cost for Honors students to attend this trip, but space is limited. If you are interested in this Honors College ASB, please contact Ms. Hunter or Dr. Thomas, or sign-up through AUInvolve (listing is at the bottom). 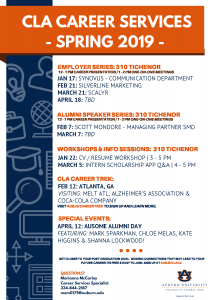 Auburn University’s Office of Sustainability as well as Alternative Student Breaks through the Office of Student Involvement are offering a variety of volunteer opportunities over Spring Break 2019. Both program applications are due January 25. Alternative Student Breaks seeks to take AU students elsewhere during student breaks to volunteer with a variety of different organizations. This year, during Spring Break, we are taking six trips to a variety of locations within the United States and Central America: Asheville Greenworks in Asheville, NC, Camp Summit in Paradise, TX, Loggerheard Marine Life Center in Juno Beach, FL, Serve901 in Memphis, TN, YMCA Camp Campbell in Boulder Creek, CA, and Wine to Water in the Dominican Republic. All of our trip prices include transportation, food, housing, and cost to volunteer; non-flying domestic trips are only $250, the California trip $525, and the international trip is $1,750. We also offer two $100 domestic discounts and two $500 international discounts! Simply apply at aub.ie/asbdiscount. Applications close Friday, January 25 at 5:00 pm, and here is the link to the application aub.ie/springbreak2019. 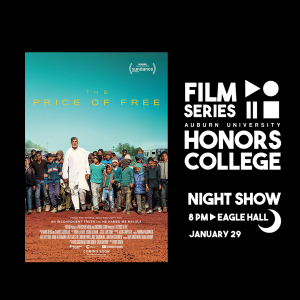 If you have any questions, please feel free to email/text/call our President, Sydney Bayer, at seb0066@auburn.edu or (205) 527-3872. Auburn University’s Office of Inclusion and Diversity and Office of Sustainability invite you to experience the Black Belt region of Alabama on a trip that boasts of community building, meaningful social impact work with community partners, and integrated reflection. 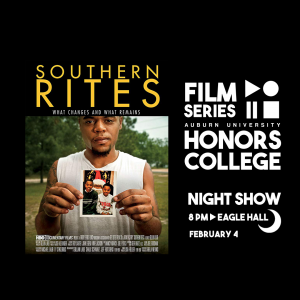 The trip will serve as an introduction to environmental and social justice concerns happening in Alabama and to the community at the center of it all. Join us on our inaugural trip to Uniontown, where we will begin building long-term relationships with a community to create sustained change. Uniontown, Alabama is a rural town located approximately 2.5 hours west of Auburn University. This predominately African American town has spent much of the past decade battling a toxic landfill (4 million tons of coal ash shipped in from Tennessee). Estimates indicate residents have a 1-in-50 risk of developing cancer from the landfill, as well as other physical and mental illnesses. Additionally, the county’s sewage system continues to experience problems causing overflow into local rivers and impacting the quality of drinking water available in the community. Service opportunities include, but are not limited to, engaging with youth in a local school, providing opportunities to develop leadership skills so students can drive change in their communities, and completing a service project at a school. Additionally, we will complete other service in the community, such as interviewing local community members and youth about their experiences through StoryCorps. Listed below are two undergraduate research opportunities provided by Dr. Lorraine Wolf. Procrastination is common and studies suggest that the majority of college students engage in some form of procrastination regularly. We often procrastinate because doing whatever task is in front of us, such as writing a paper, seems more unpleasant and stressful than doing something else more enjoyable, such as watching a movie. Some people even feel that they do better work under pressure. However, putting off writing the paper typically increases stress levels and anxiety even more. Additionally, research shows that students do better when they give themselves enough time to complete assignments. Breaking down a task into smaller tasks to make it feel more manageable (e.g. write one page a day for a week; commit to just working for 15 minutes at a time). Plan out the “big picture” (e.g. pencil in all your assignments for the semester when you first get your syllabus). Change how you talk to yourself (e.g. “Writing this paper is going to be so hard!” vs. “I get to use my creative side today as I write this paper!”). Reward yourself (e.g. I can watch a movie once I write an outline for my paper). If all else fails, consider “productive procrastination” (e.g. clean your room before writing the paper). This week Honors Serves offers a variety of volunteer opportunities in the community. Time: Wednesday 2:05, meet in the Comer Parking lot at 1:45. Volunteers are also required to complete an application, orientation, TB test, and background check. You may attend a training session before all of these are completed. Email Natalie to get the required applications and forms. 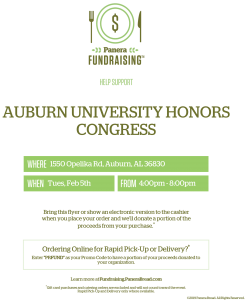 In the next few weeks, Honors Congress will be hosting three benefit nights at many popular Auburn restaurants. 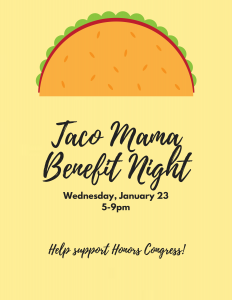 The first is January 23 from 5-9 at Taco Mama. The second is January 31 from 11am-2pm at Panda Express in Foy. 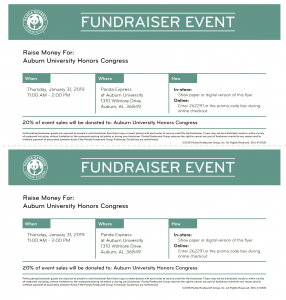 The third benefit night is on Feb. 5 from 4-8 pm at the Panera on Opelika Rd. Remember to keep bringing in clothing to Dr. Thomas in Cater Hall through the close of business January 31. Especially need sizes 10 and up! Dr. Angela Calderon is offering two undergraduate research opportunities listed below. 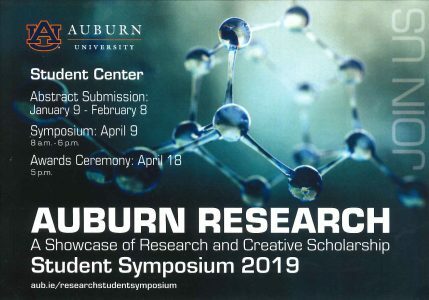 (1) Dr. Calderon is trying to identify one outstanding undergraduate student with good scientific reading and writing skills and lab hands-on exposure who may be a potential candidate to join her lab in Spring 2019 and eventually apply for an Auburn University undergraduate research fellowship. The student will be responsible for assisting in a project on “Developing tropical plant extracts as natural sources of food antimicrobials for use on fresh produce.” The selected student must have an understanding of Organic Chemistry and Biochemistry. This student will be encouraged to apply for Auburn University fellowship in Spring 2019. (2) Dr. Calderon is trying to identify one outstanding undergraduate student with good scientific reading and writing skills who may be a potential candidate to join her lab in Spring 2019. The student will be responsible for assisting in scientific literature searches and writing a scientific manuscript on an application of Chemometrics to botanicals that may be published. The selected student must have an understanding of Organic Chemistry and Biochemistry and a talent on scientific writing. If you are interested in either of these undergraduate research opportunities, send your resume and a statement describing why you are interested in Pharmaceutical Sciences undergraduate research to Dr. Calderon at aic0001@auburn.edu in order to be interviewed. Dr. Calderon will interview students with a GPA of 3.85 – 4.0. The Office of Professional and Continuing Education – Auburn Youth Programs has openings for full-time summer positions as counselors and staff. Students selected to fill these positions will be working with our campus partners to facilitate a successful summer camp. Auburn Youth Programs sponsors and executes over 100 summer programs designed to educate and inspire youth in a variety of academic, athletic, and extracurricular endeavors. Our counselors and staff work closely with K-12 students to ensure their welfare while participating in our summer camps. If you’re interested in spending your summer investing in the lives of over 4,000 middle and high school students while promoting Auburn University, we want to meet you! 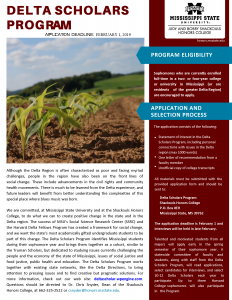 Delta Scholars Program. Sophomores encouraged to apply to this program that focuses on the issues surrouding the people and economy of the state of Mississippi. Contact Dr. Sippial at tat0004@auburn.edu for application or more information.